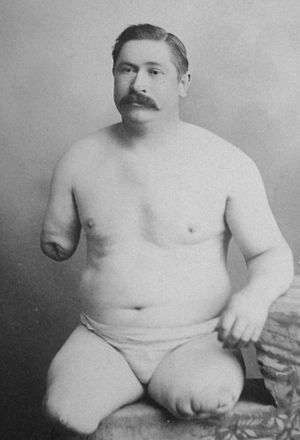 J. McKnight, who lost his limbs in a railway accident in 1865, was the second recorded survivor of a simultaneous triple amputation. Amputation is the removal of a limb by trauma, medical illness, or surgery. As a surgical measure, it is used to control pain or a disease process in the affected limb, such as malignancy or gangrene. In some cases, it is carried out on individuals as a preventative surgery for such problems. A special case is that of congenital amputation, a congenital disorder, where fetal limbs have been cut off by constrictive bands. 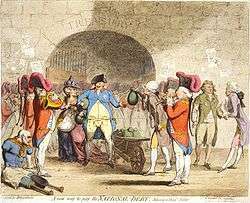 In some countries, amputation of the hands, feet or other body parts is or was used as a form of punishment for people who committed crimes. 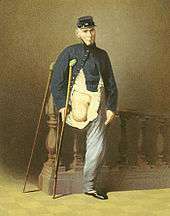 Amputation has also been used as a tactic in war and acts of terrorism; it may also occur as a war injury. In some cultures and religions, minor amputations or mutilations are considered a ritual accomplishment. Unlike some non-mammalian animals (such as lizards that shed their tails, salamanders that can regrow many missing body parts, and hydras, flatworms, and starfish that can regrow entire bodies from small fragments), once removed, human extremities do not grow back, unlike portions of some organs, such as the liver. A transplant or a prosthesis are the only options for recovering the loss. In the US, the majority of new amputations occur due to complications of the vascular system (the blood vessels), especially from diabetes. Between 1988 and 1996, there were an average of 133,735 hospital discharges for amputation per year in the US. The word amputation is derived from the Latin amputare, "to cut away", from ambi- ("about", "around") and putare ("to prune"). The Latin word has never been recorded in a surgical context, being reserved to indicate punishment for criminals. 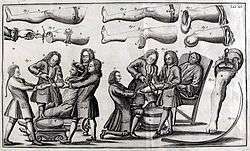 The English word "amputation" was first applied to surgery in the 17th century, possibly first in Peter Lowe's A discourse of the Whole Art of Chirurgerie (published in either 1597 or 1612); his work was derived from 16th-century French texts and early English writers also used the words "extirpation" (16th-century French texts tended to use extirper), "disarticulation", and "dismemberment" (from the Old French desmembrer and a more common term before the 17th century for limb loss or removal), or simply "cutting", but by the end of the 17th century "amputation" had come to dominate as the accepted medical term. 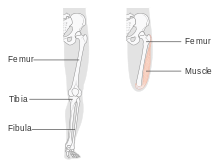 Below-knee amputation, abbreviated as BKA. 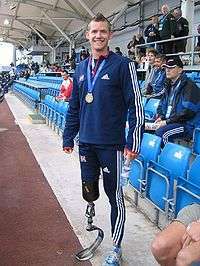 Intentionally performed surgical below-knee amputation can be performed by transtibial techniques such as Burgess and Kingsley Robinson. amputation of the eyes (blinding). Many of these facial disfigurings were and still are done in some parts of the world as punishment for some crimes, and as individual shame and population terror practices. In 2007, 66-year-old Al Hill amputated his leg below the knee using his pocketknife after the leg got stuck beneath a fallen tree he was cutting in California. In 2007, Sampson Parker, a South Carolina farmer, cut off his own arm after it became stuck in a corn harvester. In 2003, 27-year-old Aron Ralston amputated his forearm using his pocketknife and breaking and tearing the two bones, after the arm got stuck under a boulder when hiking in Utah. He documented the story of his ordeal in his book Between a Rock and a Hard Place which was turned into the movie 127 Hours. In 2003, an Australian coal miner amputated his own arm with a Stanley knife after it became trapped when the front-end loader he was driving overturned three kilometers underground. The amputation proved to be unnecessary as emergency services arrived and recovered the trapped arm, but were unable to reattach it. Rarely, self-amputation is performed for criminal or political purposes. On March 7, 1998, Daniel Rudolph, the elder brother of the 1996 Olympics bomber Eric Robert Rudolph, videotaped himself cutting off one of his own hands with an electric saw to "send a message to the FBI and the media." Traumatic amputation (an unexpected amputation that occurs at the scene of an accident, where the limb is partially or entirely severed as a direct result of the accident, for example a finger that is severed from the blade of a table saw). Amputation is used as a legal punishment in a number of countries, among them Iran, Yemen, United Arab Emirates, Saudi Arabia, Sudan, and Islamic regions of Nigeria. The first step is ligating the supplying artery and vein, to prevent hemorrhage (bleeding). The muscles are transected, and finally the bone is sawed through with an oscillating saw. 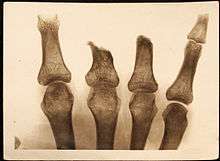 Sharp and rough edges of the bone(s) are filed down, skin and muscle flaps are then transposed over the stump, occasionally with the insertion of elements to attach a prosthesis. Guns, weapons, explosives, dynamite, bombs, fireworks, etc. Amputations are usually traumatic experiences. They can reduce the quality of life for patients in addition to being expensive. 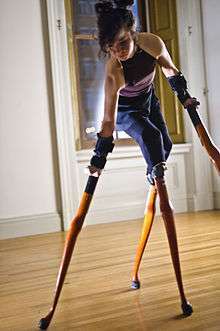 In the USA, a typical prosthetic limb costs in the range of $10,000–15,000 according to the American Diabetic Association. In some populations, preventing amputations is a critical task. The establishment of laws, rules and guidelines, and employment of modern equipment help protect people from traumatic amputations. 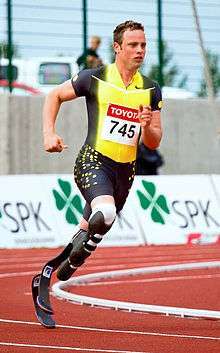 In many cases,the phantom limb aids in adaptation to a prosthesis, as it permits the person to experience proprioception of the prosthetic limb. To support improved resistance or usability, comfort or healing, some type of stump socks may be worn instead of or as part of wearing a prosthesis. A woodcut engraving in Feldbuch der Wundarzney (1517) by Hans von Gersdorff, showing how to remove a leg. 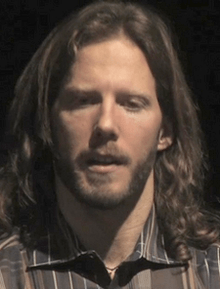 Aron Ralston, an outdoorsman who was forced to amputate his own right arm with a multi-tool after having it trapped between a boulder and a canyon wall. An amputee of the right leg photographed in the Historic Center of Quito in 2013. ↑ "Amputee Coalition Factsheet". Amputee-coalition.org. 2012-07-23. Retrieved 2013-04-22. ↑ Pinzur, M.S. ; Stuck, RM; Sage, R; Hunt, N; Rabinovich, Z (September 2003). "Syme ankle disarticulation in patients with diabetes". J Bone Joint Surg Am. 85–A (9): 1667–1672. PMID 12954823. ↑ Man Pinned Under Tree Amputates His Leg Archived August 8, 2011, at the Wayback Machine. ↑ "Farmer Cuts Off Right Arm With Pocket Knife to Save Life". Foxnews.com. Retrieved 2013-04-22. ↑ "Farmer Describes Cutting Off Own Arm". Wyff4.com. 2007-11-24. Retrieved 2013-04-22. ↑ Kennedy, J. Michael (May 9, 2003). 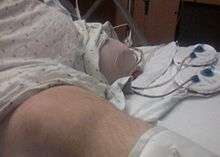 "CMU grad describes cutting off his arm to save his life". Pittsburgh Post-Gazette. Archived from the original on 2010-11-18. Retrieved 2008-05-07. ↑ "Arm trapped, and fearing fire, tough miner knew what to do". The Sydney Morning Herald. Archived from the original on 2010-11-18. ↑ "Bombing suspect's brother cuts hand off with saw". March 9, 1998. Archived from the original on 2010-11-18. ↑ RTE: Aussie Rules star has finger removed Archived August 15, 2009, at the Wayback Machine. ↑ Australian Rugby Union (2006-10-17). "Tawake undergoes surgery to remove finger". SportsAustralia.com. Retrieved 2013-04-22. ↑ United Nations High Commissioner for Refugees (2008-01-07). "UNHCR article on amputation as a punishment in Iran". Unhcr.org. Retrieved 2013-04-22. ↑ Johansen K, Daines M, Howey T, Helfet D, Hansen ST Jr (1990). "Objective criteria accurately predict amputation following lower extremity trauma.". J Trauma. 30 (5): 568–72; discussion 572–3. doi:10.1097/00005373-199005000-00007. PMID 2342140. ↑ "Scuba Tanks as Lethal Weapons". undercurrent.org. Retrieved 29 August 2015. ↑ Weiss AJ, Elixhauser A, Steiner C. Readmissions to U.S. Hospitals by Procedure, 2010. HCUP Statistical Brief #154. Agency for Healthcare Research and Quality. April 2013. ↑ Richard S. Dillon (May 1997). "Fifteen Years of Experience in Treating 2177 Episodes of Foot and Leg Lessions with the Circulator Boot". Angiology. 48 (5 (part 2)): S17–S34. doi:10.1177/000331979704800503. Archived from the original on 2010-11-18. ↑ Richard S. Dillon; Yai, H; Maruhashi, J (May 1997). "FPatient Assessment and Examples of a Method of Treatment. Use of the Circulator Boot in Peripherical Vascular Disease". Angiology. 48 (5 (part 2)): S35–S58. doi:10.1177/000331979704800504. PMID 9158380. Archived from the original on 2010-11-18. ↑ Vella A, Carlson LA, Blier B, Felty C, Kuiper JD, Rooke TW (2000). "Circulator boot therapy alters the natural history of ischemic limb ulceration.". Vasc. Med. 5 (1): 21–25. doi:10.1191/135886300671427847. PMID 10737152. ↑ Heidi Schultz (January 2005). "The Science of Things". National Geographic Magazine. Archived from the original on September 6, 2008. ↑ Ryan, Joan (March 25, 2006). "War without end / Damaged soldiers start their agonizing recoveries". The San Francisco Chronicle. Archived from the original on 2010-11-18. Wikimedia Commons has media related to Amputations.